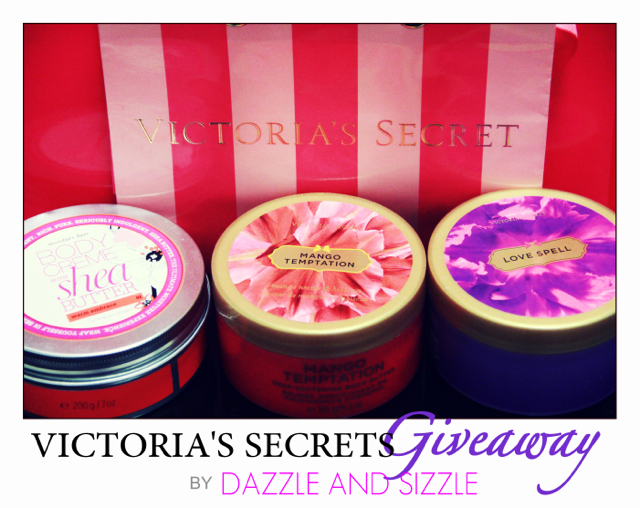 Dazzle and Sizzle: GIVEAWAY : 3 lucky winners get Victoria's Secrets goodies. GIVEAWAY : 3 lucky winners get Victoria's Secrets goodies. I am excited to announce this giveaway , on the occasion of my blog turning two in a few days! Well, I know I have been a bummer when It comes to doing Giveaways. This is my second giveaway, the first one being a sponsored one. So technically the first giveaway I am ever hosting! Not good, so I have decided to be more proactive on this front. I am currently obsessing over Victoria Secrets Body Butters.Me likes the packaging and fragrance! More over , It is soon going to be Winter time, so here comes 3 Victoria Secret Body Butters for 3 Lucky winners. The contest ends on 15th December' 2012. All entries will be thoroughly verified , so please make sure there is no error, otherwise you will have to be disqualified. Please send in your queries via comments section or contact form . All you need to do is, scroll down and fill in the giveaway form by Rafflecopter. Only the first two steps are mandatory, but for each step you follow, you receive entries(points). The more entries(points) you receive, the higher your chances are of winning. You can get total 30/ 30 points , if you complete all the steps. So let's get started ! Scroll down for the giveaway form. The image to the left is a small size image (250px *250 px) . You can right click to copy it , and then paste it on your blog side bar . 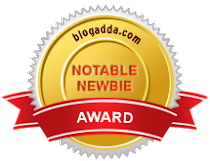 i just got invited to your blog via a frnd. thanks for the lvely giveaway..
wud really like the love spell one or the one with shea butter..
awesomeee :) would love to win these !! hey..nice giveaway....I never use Victoria Secret's product before...wanna try and wanna win too..
hey Tany, i am your new follower, your blog looks great.. Thank you for the fab giveaway. If I win :) I would love to have the love spell body butter . If I win I would love to have the Victoria Secret's Moisture Luxe Body Creme with Shea Butter - Warm Embrace. Thanks for the lovely comment on my blog. Have entered the giveaway and following you now..
Would you like to follow back?? Hi еveryonе, it's my first go to see at this website, and article is in fact fruitful for me, keep up posting such articles. Hi, thanks for the giveaway... I am new to your page. :). fingers crossed to win this giveaway. i would love to try Mango Tempation. Love spell . . didt the name cast a spell <3 <3 . . . wont mind shea butter though too :) :) . .
wud LOVE to win "LOVE SPELL"
I'm holding a giveaway at my blog too. Do participate! Genеrallу I don't read post on blogs, but I wish to say that this write-up very forced me to try and do it! Your writing taste has been surprised me. Thank you, very nice post. Halloween 2012 : A night to remember !